Just Romantic Suspense: Annual Harlequin Backlist Sale! Harlequin is happy to announce their third annual backlist sale. 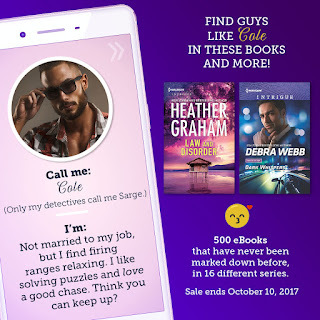 Each year Harlequin has given readers a chance to get incredible deals on a large variety of romance novels. This year, they are having 500 ebook titles go on-sale from October 7-10, 2017, all for just $1.99 each. Even better news is that all titles included in the sale fall in the original on-sale range of June 2016 – June 2017, and have never been marked down before! For more information, visit the Harlequin Blog. You can find these ebooks at some of your favorite e-retailers including Amazon Kindle, Barnes & Noble Nook, iBooks, Google Play, Kobo and Harlequin.com. 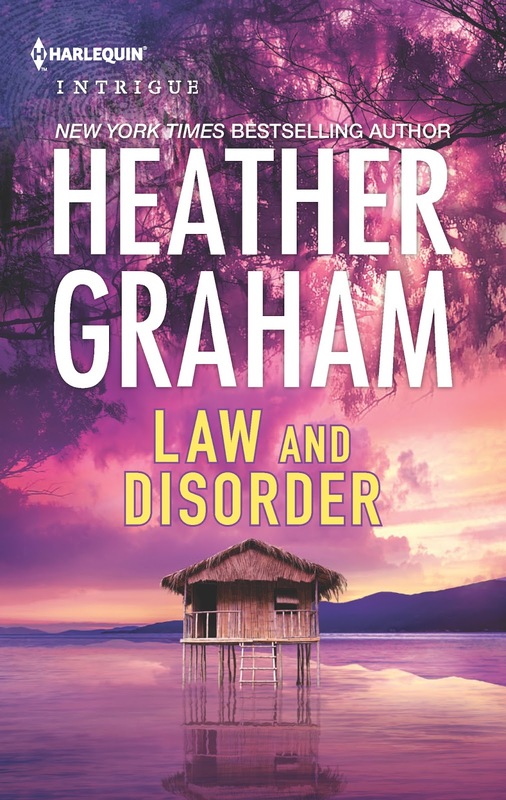 Law & Disorder by Heather Graham (original on-sale January 17, 2017): Desperate to escape her kidnappers, Kody Cameron can turn to only one man…and he's holding a gun. Outnumbered and trapped in the deadly Everglades, she has little recourse, but something in this captor's eyes makes her believe she can trust him. Does she dare to take the risk? 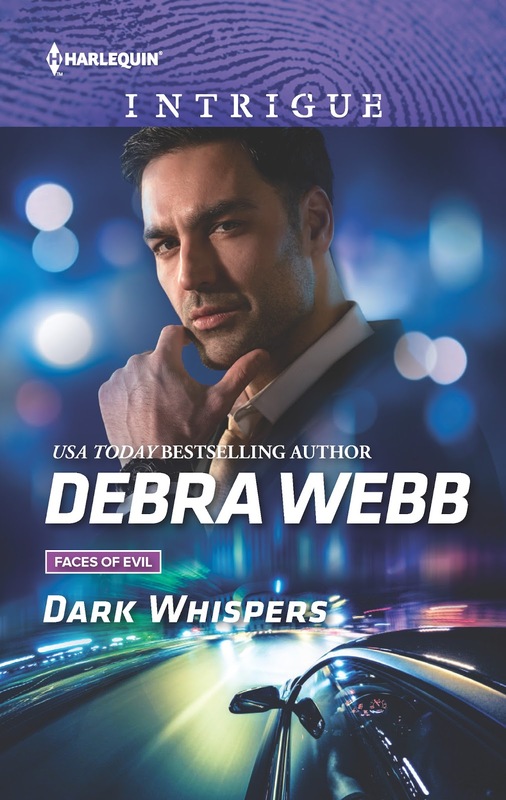 Dark Whispers by Debra Webb (original on-sale August 23, 2016): Former homicide detective Clint Hayes has his first client as a private investigator: a fragile beauty he isn't sure he can trust. An injury has left Natalie Drummond with gaps in her memory, and she sees and hears things that aren't there. But she's sure she shot an intruder in her Birmingham mansion. So where's the body, the gun, the evidence? When it's clear someone is trying to kill his vulnerable client, Clint appoints himself her protector, working overtime not to fall for her. But someone is dead set that Natalie never regains her memories—or makes new ones with Clint. Six-Gun Showdown by Delores Fossen (original on-sale July 19, 2016): "I'm not dead." The voice mail rocks deputy sheriff Jax Crockett to his core. A year ago, Paige was murdered by the Moonlight Strangler. Yet his ex-wife just showed up at his ranch—out of options and out of time. There are only two reasons Paige would come back to Texas with a killer hot on her heels: Jax and their toddler son. Faking her death was the only way to keep them alive. But now it's Jax who's risking everything to protect his family. The cowboy lawman is also reawakening a powder keg of desire. A desire that's primed and ready to explode. Giving in will up the ante, igniting the embers of a love they may not live to claim. Christmas Kidnapping by Cyndi Myers (original on-sale October 18, 2016): When her son is kidnapped at Christmastime, a therapist must turn to an FBI agent for help – before it's too late... Something is stopping Special Agent Jack Prescott from being his best. He's run countless missions, but when one hits too close to home, he needs help that most men wouldn't ask for. Andrea McNeil has counselled plenty of FBI professionals before, but no one has been harder to reach than Jack. She's never been involved with one of her patients up close and personal, but when her son is abducted, she turns to Jack for help. Now they have to help each other to bring her son home and stay a step ahead of his kidnappers. Both of them need a breakthrough - and a miracle - if they're going to bring Ian home for Christmas. 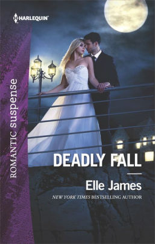 Deadly Fall by Elle James (original on-sale January 3, 2017): New York Times bestselling author Elle James's chilling romance brings together a billionaire and his beautiful bodyguard! Harlequin Intrigues and Romantic Suspense are favorites. Three of my favorite authors are featured above.